Good news! Sydney is starting a writing school for would-be clients! If you're not good enough for Sydney to read out of slush, you is still plenty good enough to give Sydney money to learns how to write! If you pays to go through Sydney's writing school, Sydney almost certainly promises to put your submissions back in her slush pile, maybes near the top! Slush pile is not quite tall enough to get Sydney into prime afternoon sunny spot! Of course, Sydney cannot teach you. First, she is busy napping on top of slush-pile. 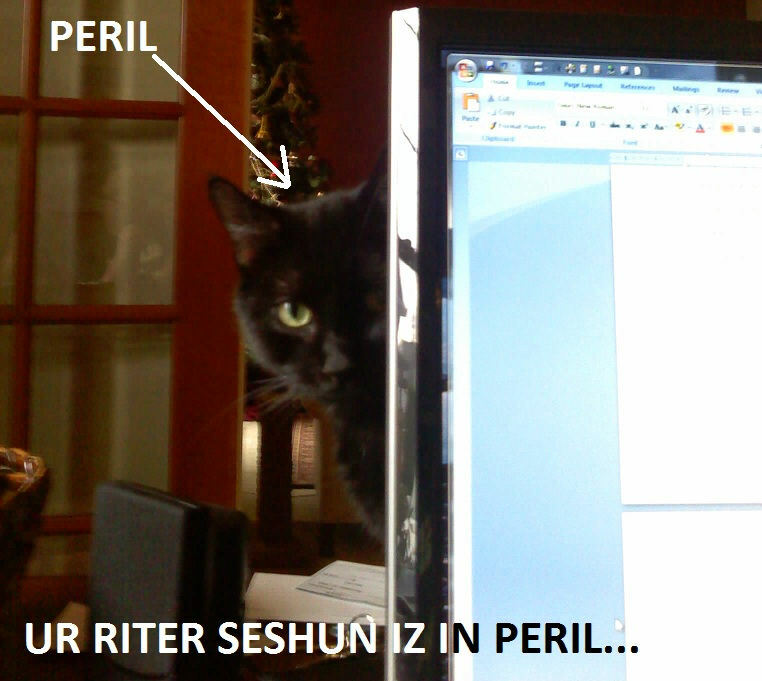 Seconds, she is just a little cat, and cannot write. Get your moneys ready! Sydney will be right back! Yes, you is right. Sydney has made some little mistake in handling your money! Maybe she forgot to send your share that royalty check, or those monies from that foreign-rights sale, or that low-dollar Hollywood option. And maybe while she was at it, maybe she forgot to send along royalty statement or other paperwork that would give you some idea you was even owed money. Thing is, some money that maybe should have gone to you didn't. You caught me! Mys bad! Hey! Mistakes are made! But it was not a big mistake. Just a little check! Maybe a hundred bucks. Maybe a little more. Maybe a little less. Certainly not enough to worry your pretty little head over! Just a drop! Just a drop! But you is just one client. Sydney has many clients. Hundreds clients! A drop here. A drop there. It adds up! Hmmm. Sydney's water bowl is suddenly overflowing! How did this happen? Yesterday, person says to me, "Sydney, do you co-mingle your personal, business, and client funds? I've heard this can lead to trouble." But Sydney will answer anyway. Sydney has no secrets. None she will tell you about anyway. Sydney does not co-mingle funds. Sydney puts all funds in blender and hits LIQUEFY button! All funds completely mixed into unidentifiable mess! What? You says you has payment coming? Well sure, just look in here and point at it! What? Why you look so confused? While you figure it out, Sydney will pour a big glass of assets for herself! Oh! You are too slow! Blender empty now! Doing this makes it much easier for Sydney to answer all financial questions and/or charges with her stock answer: "Huh?" I will NOT take your call today!" Silly writers think that value of their manuscript (and by extension, themselves) is absolute. It maybe be good, or it may be bad, or may be somewhere in-between, but whatever it is, it is, today, tomorrow, and the next. Pssh! Is all a bunch of cat-sand! Value of manuscript can only be determined in the context of the here-and-now in Sydney's world! Now, you might might think this has to do with publishing market. Vampire books is hot one day, maybe glut the next. Good theory! But this would mean that Sydney is keeping tabs on publishing market, and that is too much work. No fun either, so she does not do. No, it means that importance of every manuscript goes up and down relative to Sydney's workload. If Sydney has Big Deal going that requires all her attention, every other manuscript in her office looks just a little bit more like crap. If Sydney has a big back-log of slush (and when does she not? ), all looks like crap. 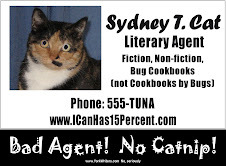 If Sydney has too-many clients clamoring for her attention and approval (and since Sydney loves money, Sydney always has more clients than she can shake a catnip-mouse at) then everything in office start to get a certain stink about it. What is funny is, people put so much value in Sydney's approval, when all this is TOTALLY BEYOND THE WRITER'S CONTROL! All control is Sydney's in how many clients she takes on, how eagerly she seeks new clients, how she manages her time, and of course, how many naps she takes! ALL POWER IS SYDNEY'S! This is just one more more way that writers willingly hand over power over their lives and careers to Bad Agent Sydney, and not even know! Somebody has come up with recipe for a "Literary Agent Cocktail." Seems like a real agent in that it is bitter, difficult, and over-complicated. On the other hand, Sydney thinks that any drink can be improved by the addition of tuna juice. In fact, any drink that has anything OTHER than tuna juice or fresh water is bad, and not in a good way, so that whole idea is out. Just the same, maybe you will want to give it a try. Here's the post on MediaBistro.com, with a link to the actual recipe. Enjoy. LITERARY AGENT COCKTAIL. Has been a while since Sydney posted writer-cat photo winner. Too sad. But life goes on, and is time for Sydney to get back on the horse. (Okay, in Sydney's case, is more like "get back on the pillow.") So Sydney goes looking through her files of entries and finds good one! This is Sumo, cat-supervisor of writer Kay Kenyon. Read about Kenyon-person at www.KayKenyon.com. But is Sumo's picture that wins Sydney over. Look at this sweet face! 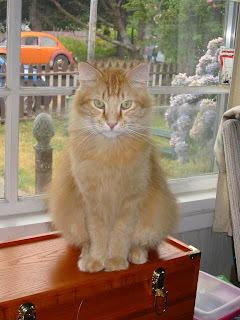 Reminds Sydney of her enforcer, Mr. Oz, if Mr. Oz were not a cruel and merciless agent of pain and chaos. Also has blue eyes! Look! Pretty! PRIZE TIME! Treat for Sydney! Hey, Kenyon, go gives Sumo treat! You know that one he likes! While you doing, we looks at your note! Be inscrutable. Never tell what you're working on. You know, people just aren't that into you. Make 'em wait. Kill mice. Those little pattering feet of negative thoughts? Pounce and kill. Race around the yard. Sitting at the keyboard will ruin your back and give you carpal tunnel or whatever. Stay in shape, people. Be arrogant. Never let 'em see you sweat. The business is tough enough without being pegged as a whiner. Sharpen your nails. Study your craft. Read how-to books, go to conferences. Stop whining. Hecks, yeah he is! Big kitty-congrats to winner Sumo! 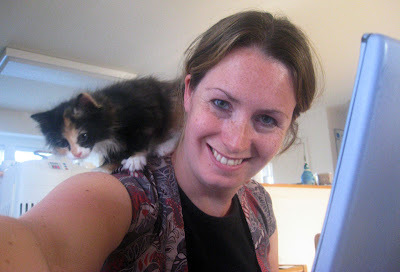 ALL WRITERS NEED CAT SUPERVISION! See link at bottom of message to find shelter near you where CAT SUPERVISION IS WAITING! GO! A while back this writer, we'll call him "Chump," sent Sydney a manuscript, asking for representation. Sydney sees how she could put special Sydney "touch" on it, but she had just thrown up on another writer's book, and didn't have it in her that day. So she passed. Now is six months later. Chump writer is back! So is Chump writer's book, looking just like last time Sydney saw it! Only one thing different: writer submitted book themselves and have a 3-book offer from major publisher! Now Chump wants Sydney to take them on as client and negotiate the deal! Sydney's reaction is obvious: HECKS NO!!!!! "But," you says, "Sydney, this is free money! Almost no work, and you hate work!" This is true, but there is one thing more important than money to Sydney... Okay, tuna. TWO things more important than money to Sydney, and the second one is SYDNEY'S EGO! How can stupid writer think they could sell manuscript without Sydney's "improvements?" Then, to adds insults to injuries, Chump GOES AHEAD AND DOES IT! But still, Sydney thinks: FREE MONEY. FREE MONEY THAT CAN BE USED TO BUY TUNA. But what about Sydney's ego? So Sydney has plan. Agrees she will represent deal, but ONLY if SHE is allowed to revise books first. 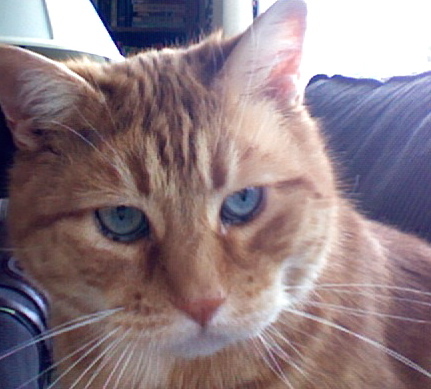 (Ate some funny-colored cat-kibble from bottom of old bag this morning, and am ready to RUMBLE!) Is perfect plan! Goes down like this! Publisher likes revised book better, or at least doesn't hate it so much to kill deal. Sydney's wonderfulness vindicated! You may think that Chump will never go for it, but you never know. They was silly enough to come back to Sydney in the first place! It is good to me me! Client came to Sydney recently wanting Sydney to track down missing royalty statements on her low-mid-list book. What? Like Sydney has nothing better to do? Why Sydney not care? If there is money, Sydney gets cut, right? Trouble is, this is not big book. If there is money, and this is only if, it is what Sydney calls "no comma money." This means a number with no comma in it. Sure, this could be big deal for author, but Sydney only gets 15% So for Sydney, even comma money could be as little as $150! That will not even pay this week's tuna bill! Sydney is all about the bottom line, and your little checks is not that! Sure, little checks add up, but so does work! SYDNEY DOES NOT WANT WORK! Sydney has no time for your little, tiny concerns! You is not worth my time little peoples! This is so upsetting, Sydney will have to go take naps now. Sorry clients! No work for you today! Sydney is behind on her cat photo winner postings, and is feeling especially bad about it today. Word has reached Sydney's office of recent, sad passing of most-excellent writer-supervision-cat Ezri Dax, who looked after writers Kristine Rusch and Dean Wesley Smith. Sydney has had picture of Ezri here for some time and had been planning to make winner, but fell behind. Now is too late for her to win treats, and this makes Sydney very sad. Sydney did not know Ezri well, though Sydney comes from the same neighborhood. Somehow our paths not cross. Traveled in different circles, I guess, or different levels. But as regular readers know, Kristine Rusch is big pain in Sydney's side most of the time, and Hat-man Smith is always making with the crazy-writer-talk, and takes extra special kitty to supervise writers such as these! Sydney is very sad for them that they do not have wonderful Ezri to tell them what to do any more. 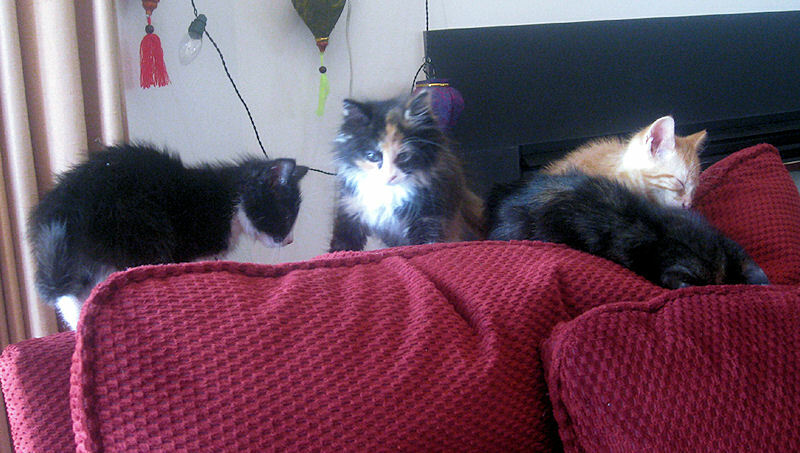 Fortunately, they have other excellent cats to supervise them too. Apparently, they is so bad that even wonderful cat like Ezri Dax could not manage them alone! 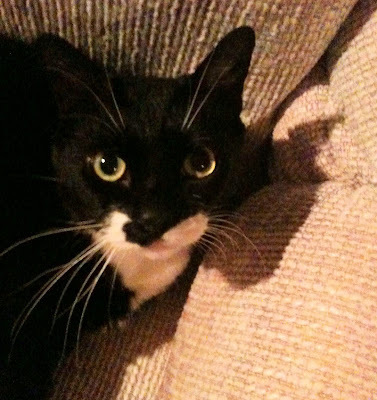 Sydney has pictures of other kitties and will post soon, but today is all about Ezri! So here is picture of Ezri Dax. 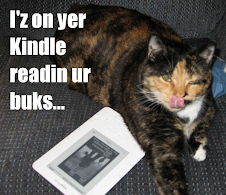 ALL READERS GIVE TREATS TO YOUR KITTIES IN EZRI'S HONOR! DO NOW! Sydney buries hatchet (for today) and sends sympathy rubs to Kris-lady and Hat-man. Sydney has heard that some people are confused about what to do at writer's conferences. Some silly people think they should be learning about craft, talking to other writers, learning business, listening to editors. NO STUPID PEOPLES! ALL IS ABOUT GETTING AGENT! WITHOUT AGENT IS NO POINT! CAN NOT SELL BOOK WITHOUT AGENT! NO POINT IN WRITING BOOK WITHOUT AGENT! GET PRIORITIES STRAIGHT!!!! Focus all attention on agents! Ignore editors! Ignore writers! LISTEN ONLY TO WHAT AGENTS SAY! Do what necessary to curry agent favor and attention! Flattery! Gifts! Whipped-cream bikini! TUNA! Remember: WITHOUT AGENT, U IS NOTHING!